This week we welcomed all our students back to the College. On Wednesday, our Year 12 students did an outstanding job assisting our new Year 5 students to take those first tentative steps as ‘brand new’ Villanovans. I know many of the Year 5 students were quite nervous about starting at their new school and meeting their classmates and teacher. Those fears were quickly swept away through the warm welcome they received from all in our community. We are all looking forward to sharing the next eight years together. In 2019 our theme is exploring the meaning of community/communitas. We often use the term community to describe our College. Parents describe Villanova College as a strong, supportive community. During this year we will explore the meaning of the term community or communitas and rediscover why it is one of the key characteristics of an authentic Augustinian school. I was most impressed with the standard of dress of our students as they returned to classes this week. All students begin the year with the best intentions and I will them to continue to wear their uniform with pride. I thank all parents for your efforts in ensuring our students have returned well-groomed and dressed ready to begin the new year. In our climate wearing a broad brimmed hat is one way of providing adequate sun protection when out in the sun. It is one simple step we can take to help educate our young men about being ‘Sun Smart’ when outdoors. In addition to the 12 new staff that I introduced in my welcome correspondence last week, we also welcome to the College Mr Robert Stewart who will be teaching Music during Term 1. Robert brings to the College a wealth of experience in classroom music. Our Year 11 students will be the first cohort of students to experience the new Senior Studies syllabuses and the new Tertiary Entrance system – ATAR. Over the past two years we have been preparing for this significant change to Senior Schooling in Queensland and are eagerly looking forward to the challenges of a new system. The new Senior Syllabuses will see the introduction of new courses and new subjects available to students. Assessment in the subjects has been reduced to four major pieces of assessment totalling to a mark out of 100. For the majority of subjects three assessment pieces will be set internally, with the final paper being set by an external panel. Embedded in the new syllabuses are the 21st Century skills and capabilities required for the future. Through an extensive range of experiences and learning opportunities students will learn to be critical and creative thinkers, sophisticated communicators, collaborators and productive members of teams with well developed personal, social and technological skills. Thank you to the many families who took the time to complete the 2018 MMG Education School Improvement Survey. The data analysis has been delivered to the College and over the coming weeks I will share with our community the results of the survey. There is something sacred about the first year at Villanova College. It is the combination of putting on an academic uniform, with belt and knee-high socks, and pulling down the brim of a stiff broad brimmed hat. The anticipation of all great achievements yet to come as you cart the box of new stationery through the school gates. Seeing your class teacher for the first time, perhaps unable to manage much conversation, but your smile is wide and palms a little sweaty. In awe of how pristine the classroom looks with new displays pinned to perfection. Knowing mum and dad have some butterflies too, as this is a fresh start for everybody, and this might mean there are a lot of photos taken with nervous laughter. This is a beginning of life as a Villanovan and like the boys of 1947 on the north side of the river, or the boys in Coorparoo since 1956, our sons in 2019 become a family, a community and a legacy for life. Our display of photos from the College Archives saw many families and Old Boys catching glimpses of the people and spaces that now include another 163 young men. Our Year 5 Welcome Breakfast was a feast to behold. The smell of bacon and eggs wafted throughout the Junior School precinct, and the Tagaste Terraces were abuzz as families realised that “the day” had finally arrived. Some were relieved to put the bags down, greet their teacher and then catch up with mates from the same school or sports club. Others were just very proud to be looking so smart and couldn’t wait to pose for photos with our Villa First Day Frame – ready for Instagram glory at vnc_junior_school – check it out! A few boys preferred to wait for first break – when the tummies had settled after such a big milestone. This is when we are reminded that each boy’s journey is their own to make. Every path is their own to make from this day forward. We are the privileged ones to be beside them for a short time to see them excel, be challenged and quite often, surprise themselves. To our new Year 6 students we also extend our warmest welcome. To be hitting the routine within our returning cohort means you get all the wisdom from the laughs and learning of 2018. You can be assured that you are also within the same expectations to take as much time this year to work out your place, routine and identity as a Villanovan. There are 156 brothers around you now, and they will be keen to lead you towards the Search for Truth, Interiority and Community, our core values (hint: the three pencils in our assembly area). The jovial conversations about the summer holidays heard throughout the playground certainly indicate that many souls and spirits are rejuvenated and ready to direct themselves towards new challenges. Our staff have been working industriously in the lead up to our first week back. Collaborating with Mr Graeme George, we have given priority to the College 2019 theme of Community through a Developmental Relationships Framework. This is based on extensive research and investigation into psychological, social/emotional and neuroscientific data. There are five overarching elements for us to work on this year with your sons – Express Care (show me that I matter to you), Challenge Growth (push me to keep getting better), Provide Support (help me complete tasks and achieve goals), Share Power (treat me with respect and give me a say) and Expand Possibilities (connect me with people and places that broaden my horizons). We believe that relationships matter the most when it comes to teaching pedagogies. A sense of belonging heightens the capacity to grow and learn. Having an advocate for your son makes the world of difference. Your son needs to know and feel that his presence is sought, that his contributions matter and we as educators can take on board some suggestions to improve our future teaching. I am genuinely looking forward to seeing how our staff can build their best practice within this Relationships Framework, but most of all I can’t wait to hear how the students feel about being made the priority in learning. Next week our Year 5 students will attend a three-day camp at the Apex Mudjimba site on the Sunshine Coast. I know that Mrs Melissa Wilson is working very closely with staff to ensure that preparations are well under way. Please be rest assured that this experience is devoted to building fond memories and fostering friendships that enhance the learning for the rest of the year. If you have any concerns, then your son’s class teacher should be the first point of call. All staff are experienced and there is nothing we cannot suggest or monitor to ensure your son returns on Friday afternoon with a bag full of wet, muddy gear, smelling a little like sunscreen became the new deodorant and with a smile that you know will include stories of camp food, College Counsellor Mr Hellwig’s snoring and the Year 12 students around the campfire sharing their survival tips for the next eight years. It is with great energy that I pen my first editorial of the year. I hope that everyone was able to enjoy a restful holiday period and that all Senior School students are ready to embrace the challenges of another academic year at the College with optimism and positivity. The commencement of the new school year is always an exciting phenomenon, especially for the Senior class who started on the same day their new Year 5 little brothers embarked upon their Villanova journey. It was pleasing to see the number of Year 12 students who eagerly arrived early on Wednesday to warmly welcome our newest Villanovans. 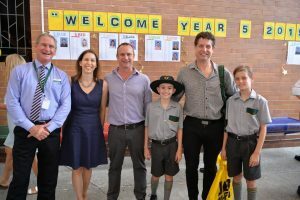 The importance of the big brother – little brother relationship cannot be understated, and I am pleased to announce that a new peer mentoring initiative will be launched this year whereby some of our Senior students will be attached to Junior School classes to guide and support our Year 5 and Year 6 students in their formative years at the College. One of the hallmarks of our philosophy of student care at Villanova is the maxim of ‘high expectations, high support’. Thank you to all Senior School parents for your support in ensuring that our students have commenced with high standards of grooming and wearing of the academic uniform. Pastoral teachers, Pastoral Area Leaders and I will continue to hold Senior School students accountable in this area throughout the year. Next week all Year 12 students will be formally commissioned as leaders of the Villanova College student body at the annual Mass of the Holy Spirit. This is a significant rite of passage in the life of these young gentlemen, whereby the Senior class pledges their vision of leadership and receives their Senior badge. All Year 12 parents are welcome to attend this ceremony. The Year 12 theme for 2019 is – Where Passion Lies, Success Follows. Unearthing those passions, gifts and graces amongst our Senior School students is incredibly important to ensure that one’s pathway at Villanova enriches all in our wonderful community. Pastoral Area Leaders will be sending home further information about these evenings as well as key focus areas for each respective year level. Lord Jesus, we pray that young people might boldly take charge of their lives, aim for the most beautiful and profound things of life and always keep their hearts unencumbered. Accompanied by wise and generous guides, help them respond to the call you make to each of them, to realize a proper plan of life and achieve happiness. It is with great pleasure that I welcome all families to Villanova College for what I hope will be an exciting year of sport ahead. Our aim is to maintain and further develop Villanova’s sports program from Year 5 – 12 and to ensure that our students are given the opportunity to participate and enjoy all the benefits which playing sport can provide. Villanova is a place which offers many opportunities for its students to become involved in a wide variety of areas including sport, music, culture etc. My advice to all students is to ‘get involved’ in the life of the College. Enjoy the challenges and friendships you encounter on the way and be proud to represent your College by the way you conduct yourself on and off the sports field. At Villanova College, it is considered a privilege to don the green and gold. I encourage all students to show pride in the uniform each week by training hard and playing even harder. Best wishes go to us all in 2019, let us all do our bit for the year to be a fun and enjoyable one! It is imperative that all students and their families regularly access the College’s website to obtain sporting information. Simply go to www.vnc.qld.edu.au , from the home page scroll down to the ‘Latest News’ section. Within this section select the ‘Locker Room’ https://www.vnc.qld.edu.au/locker-room/locker-room-july-18/ which has all the latest sports information for the week. Links from the ‘Locker Room’ will also take you to the ‘Weekly Fixture’ section which outlines the times and venues for all games for that week. Links from the ‘Locker Room’ will also take you to sections pertaining to each individual sport (for example, the AIC cricket, AIC AFL, AIC volleyball, AIC swimming etc.) which will have further details pertaining to that sport. This information includes team lists, weekly draws, training schedules and much more. The website is updated regularly and should be checked on a regular basis by all players and families throughout the entire year. Villanova families are strongly encouraged to download the College’s new App from the App Store. Simply search – Villanova College App (free download) and follow the prompts. Messages and alerts are often sent via this app. PLEASE NOTE – This is a different App to the Villanova Skoolbag App. Please delete the Skoolbag App as this is no longer used and download the new Villanova College App. Messages regarding the cancellation of matches or training, special reminders etc are often sent. The Villa View, website and app are our three major avenues for imparting information. Please check and use them regularly for all information pertaining to sport. Already all AIC volleyball, AFL and cricket team lists, training schedules, weekly game schedules, coaches’ details and much more have been added to the website for all to see, as well as information pertaining to the AIC swim season. Please take the time to navigate through the site as I believe most of your questions and queries will be answered in this section. I thank all of those who have assisted the Villanova sports program over the years in taking on the various roles needed. I encourage as many people as possible to assist in 2019 by coaching, managing, refereeing, scoring, serving at canteens etc. throughout the year when the opportunities arise. I am certainly looking forward to meeting as many people as I can over the year ahead. Tomorrow after school all capable swimmers from Year 5 – 12 are invited to join the Villanova Swim Squad to participate in a swim meet/time trial at Langlands Pool from 3.30 – 5.00pm. All Year 6 -Open cricket teams, Year 7 – 12 volleyball and Year 7 – 12 AFL teams will trial against St Patrick’s either tomorrow or Saturday 2 February. Year 5 cricketers and Year 5 and Year AFL players will have internal trials. Please read further details below and access the website to view all times and venues for each sporting activity. Good luck to all involved and please enjoy! Tomorrow and Saturday, 2 February, Villanova will participate in many cricket, AFL and volleyball trials against St Patrick’s College (SPC). All volleyball teams from Year 7 – Year 12 as well as all cricket teams from Year 6 – 12 will play games against SPC at various venues. All Year 5 cricket teams will trial internally. AFL will be played either tomorrow or on Saturday, depending on your son’s team. Please refer to the College’s website to view all times and venues for this weekend’s fixtures. Access the Villanova College website, scroll to the bottom of the home page, locate the ‘Latest News’ section and look for the ‘Weekly Fixture’ link to view the pdf doc which lists all game times and venues for each week. Links from the ‘Locker Room’ will take you to the AIC cricket, swimming, AFL and volleyball sections which will have all team lists, training schedules and coaches’ details amongst other information. By now all players should be aware that we have a full round of cricket trials this Saturday 2 Feb against St Patrick’s College, however Year 5 teams will have internal trials. As always there will be a certain level of ‘organised chaos’ as our coaches continue the selection/trial process. As this is considered to be a trial game, negotiations have been made with St Patrick’s to allow coaches from both Colleges to be flexible during the match. Therefore, leniency will be given this weekend in order for the coaches to give all players an opportunity to perform. As this weekend’s games are only a trial, may I please ask parents and players to be patient. There will be some movement of players from team to team as the coaches finalise teams ready for Round 1 next weekend against St Edmund’s College. All boys should check the web site regularly to keep abreast of all information regarding teams, training and games. All players are to wear the correct Villanova cricket uniform; have adequate water, sunscreen and hat for the games. Please be advised that all training schedules are finalised, and training has begun as of this week as per schedule posted on the web. All Year 5 training begins next week. All players from Year 5 – 12 are to wear cricket whites. Under no circumstances are players permitted to wear club shirts or club hats. Important note: All cricketers from Year 5 – 12 are asked to wear protective equipment. It is compulsory for all batsmen and wicket keepers whilst keeping up to the stumps to wear a helmet. The College will provide two helmets per kit. All players are required to purchase and wear their own cricket box protector. Cricket trials begin this Saturday morning. All teams will play at Kianawah Park, Wynnum Road Tingalpa. There are 11 cricket fields at this venue and our allocated fields (6,7,9 and 11) are in the middle and back right-hand side as you drive in to the complex. Please see the map below. Team lists are found on the web and are also located on the Junior School notice board. Boys are to be at the venue by 7.40am and they are to wear cricket whites if they have them or the Villanova College sports uniform. Cricket gear will be supplied. When the trials have concluded, the boys will be selected into teams. This year there will be an A, B and C team selected. The remaining teams will be evenly graded on ability and placed into the supplementary draw. Saturday’s draw, coaches’ details, by-laws and training schedules have been placed on the web page for you to view. A revised list for Round 1 against St. Edmund’s College will be posted on the web next week. Please note that many of the boys will change into different teams and that this is part of the trial process. There will be a number of changes made throughout the season to try and get the boys into their right ability level groups. If there are training clashes with other commitments, after these changes, please contact the Sports Office and we will try to work out a solution. It will take some time to eventually get the boys into their correct teams. Please be patient with the selection process as we can only grade the boys on what we see. Their attitude and sportsmanship also contribute to the selection process and we expect very high standards in both these areas when the boys are representing the College. In the event of rainy weather, a notification will be placed over the College’s App. An alert will only be given if games are cancelled due to wet weather. If it is raining in the morning, training will be cancelled. It may be the case that no alert on the Villanova App will be sent out in the morning. It is recommended that you contact the coach, if you are unsure. The coaches’ details can be found on the College’s website. If afternoon training is to be cancelled due to rain during the day, then an alert will be posted via the Villanova App by 1.00pm as well as an announcement to the students over the College’s PA system. If training is cancelled during the session, boys at Langlands will be taken to the undercover carpark at Easts Rugby League Club and can be collected from there. Villanova will have 19 teams participating again in the AIC volleyball competition this year. All teams are still in draft form and will be finalised after this weekend to ensure we are ready for Round 1 next week against St Edmund’s College. This Saturday, all volleyball teams are set to trial against St Patrick’s College and all training has officially begun. The training schedules, team lists, game times, team duty’s, referees and scorers are all posted on the College’s website. It will be necessary for parents, players and coaches to check the College website on a regular basis to ensure all relevant updated information is delivered. As from next weekend, all volleyball players must wear the correct Villanova College volleyball uniform as listed below. As the volleyball hire shirts will be distributed next week, players are asked to wear their full PE uniform to the trial games this weekend against St Patricks. Players are to hire their shirt for the entire season and return it to their coach at the conclusion of the season. The hire cost of $20 will be added to your son’s Term 2 school fees account. 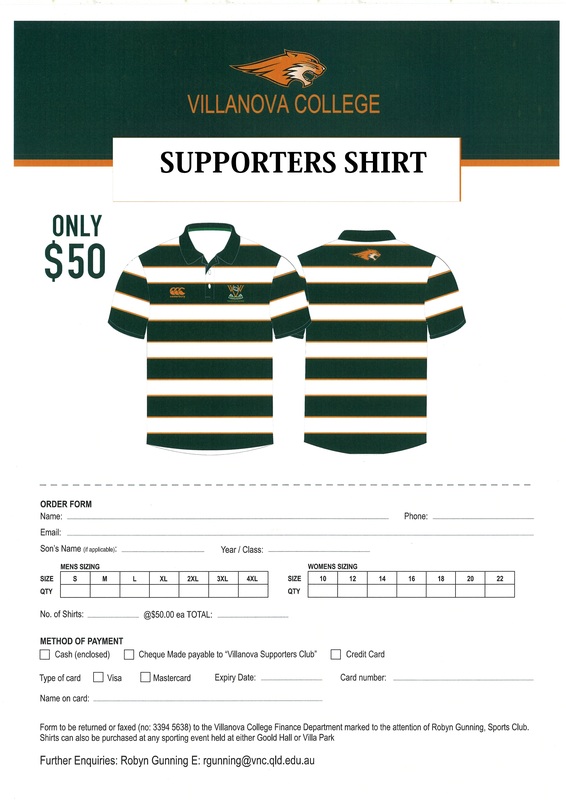 Volleyball shirts will be issued to the boys next week from the Villanova College Uniform Shop. Thursday 7 February at second break – 10A, 10B, 10C and 9 A, 9B and 9C. Coaches have been allocated to assist at the Uniform Shop on these days. All players are expected to wear the correct uniform at all times as this demonstrates pride in themselves and their College. Welcome back to the 2019 AFL season. By now all players should be aware that we have a full round of AFL trials tomorrow and Saturday. As always with trials, there will be a certain level of ‘organised chaos’ as our coaches continue the selection/trial process before finalising teams. There is no training this week. All teams will begin training in Week 2 after this weekend’s trials. Teams will be announced on Monday of Week 2, and a list of all teams will be posted on the website. These teams are not final, and boys will have the opportunity to move between A’s and B’s depending on training and game performance each week. All available players are expected to meet at least 30 minutes before their scheduled game time. Please ensure you notify your coach as soon as possible if you are unable to attend a training session or game. As AFL is new to some Villanova families, sorting through all the necessary rules and regulations may take a couple of weeks. I ask parents and players to be patient as the coaches do their best to sort everything out as soon as possible. All players will receive their playing jumpers this week and if already purchased must wear the Villanova rugby shorts and socks. Please be advised that all training schedules and teams will be finalised by Monday 4 February and training will begin at Villanova Park next Tuesday. All teams will be transported by bus to Villanova Park on training days, but parents are required to collect their sons promptly at the end of the session. It is also a requirement that all players find their own means of transport to and from games on Friday and Saturday. I am excited to get the season underway and look forward to seeing everyone over the coming weekend. Many thanks to the 66 boys who attended the first swimming squad clinic on January 21. Coaches were impressed with efforts of the boys who worked well on the day. The day was an excellent opportunity for the team members to get to know each other and for the new Year 5 students to meet each other, and the older members of the squad. We were very grateful to the Open squad members who cooked the BBQ, helped with the clean-up and generally assisted on the day, their support and leadership was appreciated by all coaches. Training continues for the next six weeks. These details are in the swimming squad newsletter and on the College website. With only six weeks left until the AIC Championships, we must have as many swimmers in the water as often as possible to ensure that we are ready for the competition. I would strongly encourage any student who would like to be part of the squad to attend time trials happening this week or see the Swim Manager for their age group. More detailed information about this year’s swimming season, including information packs, uniform requirements, dates and times of training and AIC swim meets have been handed out to students this week. This information is also available on the College’s website. The first AIC swim meet is at Langlands Pool tomorrow from 3.30 – 5.00pm. All interested squad members from Year 5 – 12 are expected to attend. The Year 5 boys had their swimming trials yesterday and have been placed into divisions for tomorrow’s Junior School Swimming Carnival at the Villanova College Pool. All Junior School parents are warmly invited to attend the carnival for all or part of the day. Seating will be available for all parents outside the change rooms at the left as you enter the pool gate. We are looking for parents to assist with timekeeping on the day. If you can assist, please see Mr Chris Everding when you arrive at the pool. All students are to wear their sports uniform tomorrow and will get changed into their togs before moving over to the pool. Students are to bring with them thongs or other casual shoes to wear from their classroom to the pool as well as sunscreen, sun shirt (optional) hats and a water bottle. The Tuckshop will operate as usual for students wishing to buy their lunch. Parents are also welcome to use the Tuckshop to purchase coffee or food. A number of Year 5 boys have been given a letter inviting them to be members of the squad depending on their times from yesterday. These boys will be required to attend an internal College Meet tomorrow afternoon from 3.30pm – 5.00pm. Times from Wednesday, the Junior School Carnival and the invitational meet tomorrow will be used to narrow down the squad to 18 swimmers in each year level in the Junior School and these boys will continue training as of next Tuesday. There are only five weeks until the championships and the squad members will be required to fine tune their strokes, practise their starts and relay changes under the guidance of our swim coaches. The Lytton District swimming trials will be held at Moreton Bay College on Friday 15 February for under 10, 11 and 12 swimmers. Only two or three boys per event, who meet the qualifying times over the next week, will be given the relevant information regarding these trials. We also need to send along a parent as an official. If your son is selected and you can assist, can you please contact the sports office and let us know of your availability. Unfortunately, we cannot release a teacher for these trials and all students must find their own transportation to and from the carnival. – A canteen will be operational at both carnivals. School Fee Statements have been emailed and are due on February 13. Payments can now be made through Parent Lounge by clicking on ‘Make a Payment’ and selecting ‘School Fees Account’. Should you wish to discuss the payment of School Fees, please contact the Finance Office on finance@vnc.qld.edu.au. There will be an information evening on Thursday, February 7 at 5.15pm in V7 for all boys who are participating in this year’s Exchange. AFAS Elders and Greg Cooley wines invite the Villanova Community to enjoy ‘ANYONE FOR TENORS – TENORI IN CONCERT’ on the Cassiciacum Gardens on Saturday February 9 commencing at 5.30pm. Bring your own picnic basket or order one when you book. 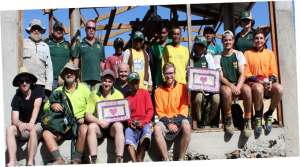 From December 1 – December 15, 2018, Liam and Mark Edgerton, Bruce and Mark Stuart, Juanita and Peter Jacobs, Campbell Muir, Tom Merrin, Matt Davies, Angus Tracey and Tony Hindmarsh participated in the second AFAS Elders Exchange to Kinatarcan Island (off northern Cebu) to assist with the construction of a mat weaving facility. This facility funded by the Villanova community will benefit all families on the island. Upon our arrival we discovered that while the construction of the building had commenced, it had not progressed as far as we had hoped. When the AFAS Elders departed on Wednesday 13 December, a plan was in place for the building to be completed by 27 December 2018. Unfortunately, the project is moving slowly due to a lack of materials at the work site.